24 Players Survive with Steve Nevius Collecting the Gold! The 2016 Run It Up Reno festival's Event 3: $235 Survivor has come to a conclusion with Steve Nevius topping the 24 survivors to not only earn the $1,000 payday, but also capture the prestigious Run It Up trophy and a seat into this week's $565 Main Event. Kicking off at midday today, 122 entries were built up on the felt throughout the day with the likes of Survivor contestants Stephen Fishbach, Anna Khait, Rob Mariano, and Tyson Apostol, along with notables Garry Gates, Jesse Capps, Chad Holloway, Nadya Magnus, and Run It Up Reno host Jason Somerville all taking part. Action was fast and furious as players continuously reentered in an effort to build a chip stack throughout the initial few levels. 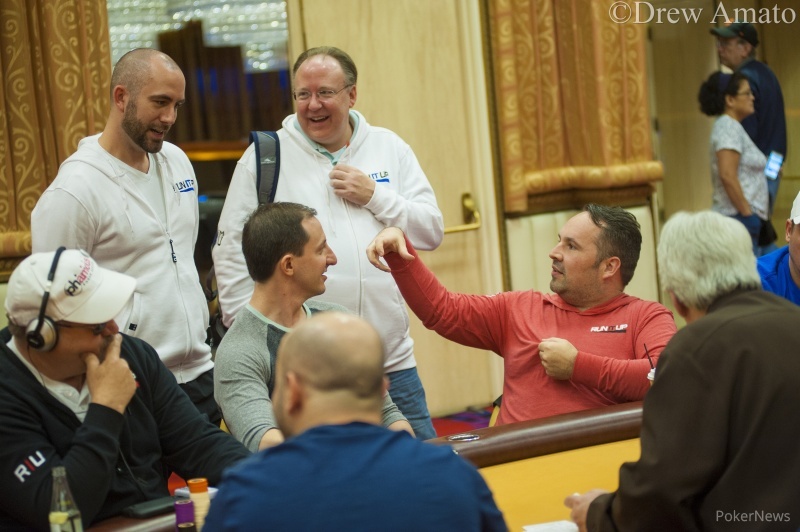 As the dust settled and registration closed, play continued at a quick pace until the bubble was reached where it would be Thomas Dominguez committing his final chips holding the and be looked up by the big blind and his . Two kings on the flop, followed by a four on the turn would ensure Dominguez earned the unwanted title of "bubble boy," while the remaining 25 players were left to survive just one more elimination to be guaranteed the $1,000. Unfortunately for recent Survivor contestant Khait, she would call all in holding the against PokerNews Editor-in-Chief Donnie Peters' . A king on the turn spelled the end for Khait, and she collected a $400 payout. As everyone's chips were counted, it was Steve Nevius awarded the top prize as he amassed a 283,000-chip stack. 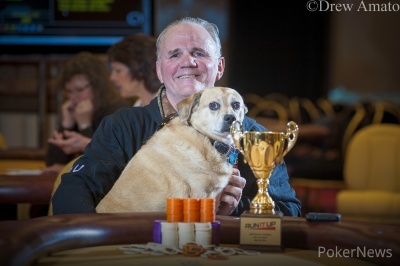 Not only did Nevius collect the $1,000 payout and $565 Main Event seat, he was awarded the Run It Up trophy that he and his service dog, Scuba, posed behind for photos. Congratulations to Nevius and the other in-the-money finishers as the focus is now on the upcoming Event 4: $125 6-Max Four-Card Pot-Limit Omaha tournament scheduled to start at 8 p.m. PT with PokerNews providing coverage. The Tournament Director and his staff are currently calculating who the chip leader is - and therefore recipient of the trophy and the Main Event seat - and paying out each table. Anna Khait Eliminated in 25th Place ($400); Everybody Wins! Following an open to 16,000, Donnie Peters moved all in from the cutoff for roughly 55,000. 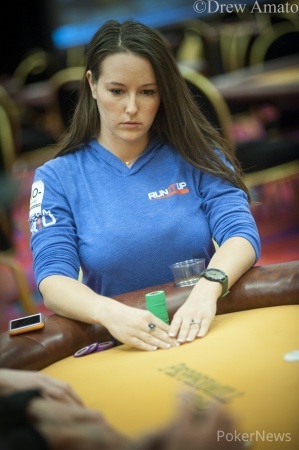 Anna Khait in the big blind called all in for her last 12,000 as the original raiser folded. With Khait a heavy underdog, the flop gave her additional outs to a chop. The turn of the however would end her tournament in 25th place as the completed the board on the river. For Khait's efforts, she collects $400 while the remaining 24 players are guaranteed a $1,000 payday. Thomas Dominguez put his last 14,000 or so in from the button. "I'm priced in," the player in the big blind said with a shrug, tossing in a chip and turning over . Dominguez was ahead with but his opponent had live cards, and a flop left Dominguez nearly dead. The turn sealed the deal as his opponent made a boat. Now, though the tournament has reached the money, there is a lower payout of $400. So, things will continue for one more elimination. The Big Game participant Nadya Magnus dwindled down to her last 5,500 and put it in under the gun. One player called, and the big blind checked. Those two checked down the board. The cutoff showed . The big blind held for an airball, but Magnus couldn't beat the tens as she had . The next elimination will mark the end of the tournament. With only 27 players remaining in the tournament, and just the final 25 receiving a piece of the prizepool, the pace of play has slowed right up. While the big stacks continue to apply pressure in an effort to ascend to the top of the leaderboard so that they can win the trophy and a seat into the Main Event, the short stacks are biding their time in an effort to sneak into the money and pocket the $1,000 min-cash. The action folded round to Donnie Peters in the small blind and he limped in as the big blind checked his option. The flop fell and Peters checked to the big blind who opted to toss in a single 5,000-denomination chip. Peters folded and slipped to roughly 50,000 as the big blind captured the pot. Kevin Barrett, who made the final table of the All In or Fold event last night, is looking for another score in the Survivor event. He checked in a battle of the blinds on a flop, and the big blind put him all in for 13,000. Barrett snap-called it off with as he had flopped a straight he doubled through his opponent, who had just one pair, .